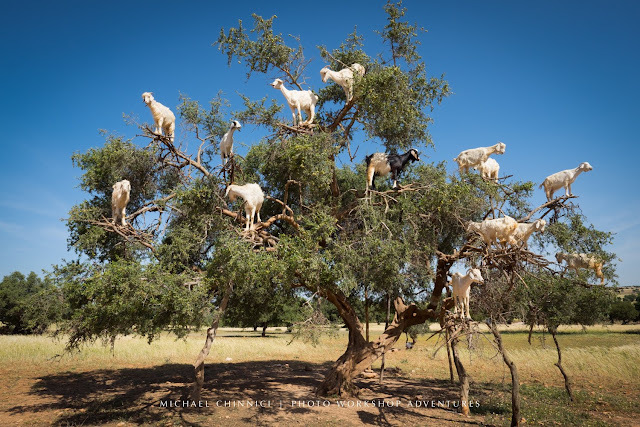 There's a peculiar video making it's way through social media of about a dozen or so goats just hanging out...in a tree. The perplexing video was filmed in Morocco by Michael Chinnici, a photographer at Moroccan photo tours. The goats are drawn to fruit of the Argan tree which ripens each year in June. The animals are skilled climbers and are aided by their cloven feet. Each foot has two toes which can spread out, providing balance while the soles of their feet are soft helping to grip the branch.